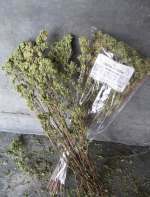 Picked while still in flower, dried oregano from central Sicily. Delicious crumbled over pasta, risotto, on bruschetta topped with fresh tomatoes and olive oil. Fresh stock from Southern Sicily! Dried Sicilian Oregano still on the stem, picked while the plant is in flower to capture the taste and aroma of this lovely herb. A small family run team grow and dry Oregano for a living. Crush a little over tomato dishes, pizza or pasta, into casseroles, over bread drizzled with olive oil or on to lamb before roasting or grilling.